Do you want the best Spike and Serve Trainer so that you can conquer the court and save yourself time during training??? Inevitable imports is COMMITTED to bringing quality and convenience to all of the products that make your life better on a day to day basis. Our STRIKE FORCE has a quality and style unmatched by competing products. Made from the best materials on the market and stress tested far beyond what is normal, our customers won't use anything else. We tested all of our competitor's Spike / Serve Trainers and made ours better on purpose. Our device will look and function great - long our competitors have given up all hope of returning a ball to anyone, much less the person that just served it. ✓ Looks amazing. Be proud pulling this bad boy out of your bag every day. ✓ EXCEEDINGLY DURABLE YET AT A REASONABLE PRICE! ✓ Built for athletes of all ages and skill levels! Many people are worried that these products won't stand up to heavy use by serious athletes - we took care of these worries during our extensive testing. We promise that your Strike Force will stand the test of time. ✔️SERVE AND SPIKE TRAINING MADE EASY: No more chasing your volleyball equipment all over the gym. No more dragging that ball return and taking out 100 volleyballs out of your car every other day. Our volleyball serving equipment aid allows you to practice on your own in the gym at any time you want. Solo training has never been easier. 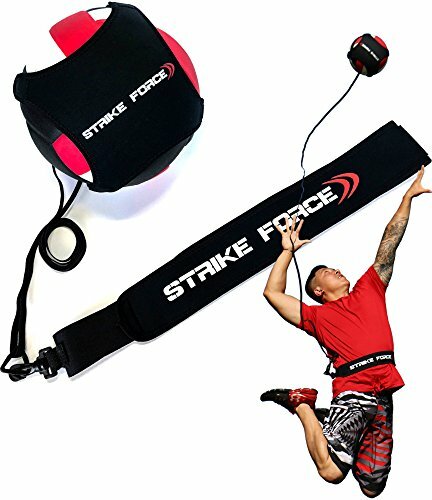 Just throw the Strike Force pal into your backpack and head to whatever gym you normally use! ✔️EASY TO ASSEMBLE: Our competitors Volleyball pals can sometimes be difficult to assemble. We made it insanely easy to put everything together and get on with your workout. No need for expert assembly or for an expensive volleyball trainer to help you strengthen your swing arm. Our device is designed to be as intuitive as possible. Grab your favorite volleyball and in just a few steps, you'll be ready to start hitting! ✔️BUILT TO WITHSTAND THE HARDEST WORKOUTS: You need a training ball that can withstand thousands of brutal hits for Volleyball, Soccer and Water Polo. That's why we created the Strike Force. Go ahead, take this gadget out of your volleyball backpack, attach a ball, hold it at arms length and give it a serious smack. Your ball will return right to your hands, every. single. time. Stop running around chasing balls. Get better in less time! ✔️GET ONE FOR THE WHOLE TEAM! The efficiency of volleyball accessories like the STRIKE FORCE becomes even more evident in big group settings! Stop disturbing the play of athletes near you by running through their game chasing balls. Keep your ball where it belongs, near you. ✔️RISK FREE PURCHASE - We are committed to customer service and maintain a 100% customer satisfaction guarantee. Please send us a message if you have any questions or concerns. View More In Sports Training. If you have any questions about this product by STRIKE FORCE, contact us by completing and submitting the form below. If you are looking for a specif part number, please include it with your message.